With Easter and Passover right around the corner, this delicious Roasted Beet and Carrot Salad is a perfect and beautiful side dish for your big holiday dinner. The bright colors are a lovely nod to the spring season, and the flavor combination is nothing short of sensational. The smoky roasted vegetables with the peppery arugula and creamy feta, topped with a sweet and tangy dressing, this Weight Watchers salad recipe is sure to become a favorite. I would also suggest topping it with some grilled chicken or roasted salmon and serving it as a main course for lunch. And at just 3 Points per serving, it’s a great bargain! With bold flavors, and a sweet and tangy taste, this healthy salad recipes is a feast for the eyes as well as the body. It makes an excellent side dish to any meal, or top with your favorite protein for a fantastic dinner salad. Preheat oven to 375 degrees. Spray a baking sheet with nonfat cooking spray. Place diced carrots and beets onto baking sheets, and lightly mist with an olive oil mister or nonfat cooking spray. Season with salt and pepper. Roast in oven until tender, about 40 minutes. In a small bowl, whisk together the oil, honey, lemon juice, salt and pepper. Add arugula and basil to a large bowl, and toss will with the dressing. 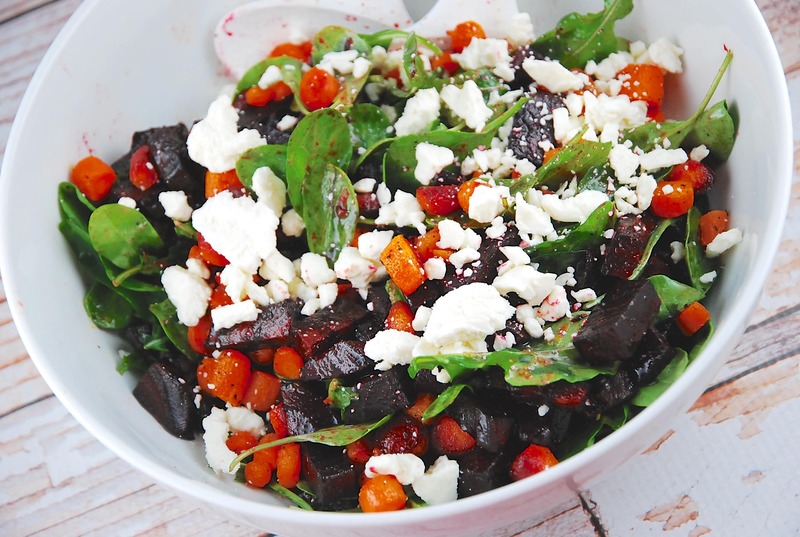 Top with the roasted carrots, beets and feta cheese and serve right away.